The Coastal History Blog 35: A Cosmopolitan Bronze Age Port? In Mediterranean studies, does the cosmopolitan port town rank alongside “sun and sea… olives and myrtle… the commonplaces pervading the literature, all description and repetition”? Articles with titles like “Cosmopolitanism Reconsidered” and “The Cosmopolitan Mediterranean: Myth and Reality” have raised doubts about the whole project. It’s one thing to state that that two or more groups coexisted in the same spot for a long time. We can certainly mention that a particular port town had a reputation for cosmopolitanism. What’s harder is articulating and defending claims about the attitudes of ordinary people, or their daily habits of interaction. 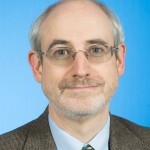 As Henk Driessen has remarked, since “cosmopolitan discourses are easier to document and analyze than lifestyles, for which direct evidence seems to be sparser and more difficult to access,” there is a risk that scholars are recycling the nostalgia-hued storytelling of exiles as a proxy for the life of entire communities. For example, many of the Greeks displaced in the Great Fire of Smyrna of 1922 wound up in Piraeus, Athens’ port, where they had an earful for oral historians (not least about how boring Piraeus was by comparison). A source, to be sure, but relying on that would be akin to substituting a conservative rant about the integrity of rural values for an ethnography of a village, warts and all. I’ve blogged before about the idea of a tolerant coast and of the (somewhat vexed) notion of the cosmopolitan port town. Even modern examples have proven challenging to research. Attitudes and sentiments just don’t leave an archival trace in the same way as births, deaths, crimes, and taxes do. Driessen and others have concluded that it is really difficult to reconstruct the mood and tenor of daily life, even in literate societies from less than 100 years ago. 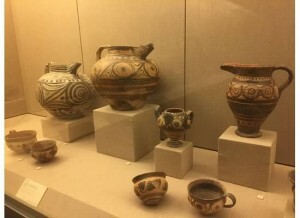 The Museum of Prehistoric Thera, located on the island better known today as Santorini, follows this line consistently throughout its displays, which showcase material found in the excavations at Akrotiri on the south end of the island. Santorini is located in the Cyclades, to the north of Crete. 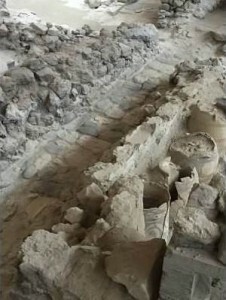 The Bronze Age town at Akrotiri traded with Minoan Crete and beyond. 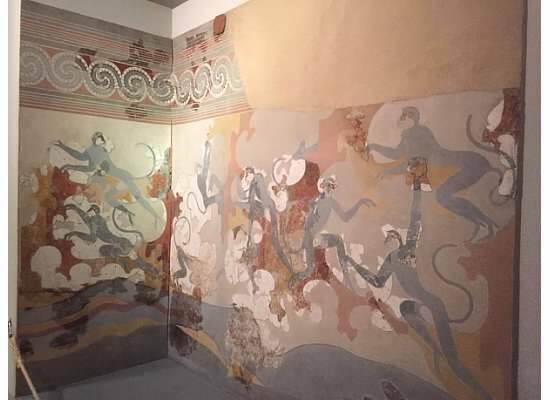 Akrotiri was clearly a sophisticated urban center, judged by the standards of its time. There was a system of record keeping, a sewer system, and possibly an aqueduct. The town had many specialized buildings, with elaborate floor plans, including one “pottery shop.” A few wall paintings have survived, protected by mudslides perhaps in the aftermath of the volcanic eruption that ended this civilization. 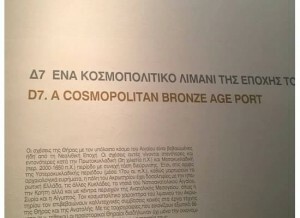 As their caption explains, the term “cosmopolitan” is supported, in the museum’s view, by the presence of a variety of imported goods and by the choice of imagery in the wall frescos. Even as a casual museum-goer, I could see the contrast between the simple, austere brushwork on the pottery produced by earlier Cycladic artists, followed by the riot of colors, movements, and shapes in the later period. I can’t fault a museum for weaving together a coherent picture using the available evidence. On the other hand, if this were the seventeenth century CE instead of the seventeenth century BCE, would we be satisfied by an argument that long-distance trade, merchants, tropical products, and pictures of monkeys on the walls of wealthy homes documented a “cosmopolitan” society—or that this was the key takeaway message? I suppose my frustration here could be reduced to my own attitude toward public history. Should a museum adopt a consistent interpretive “line” for the sake of simplicity, or should it encourage critical thinking and showcase multiple interpretations when consensus does not exist? Where archaeologists are divided, isn’t it helpful, and—in the best way—educational to admit this? There’s a bit more involved here, though, than what caption should appear on the wall of a museum. 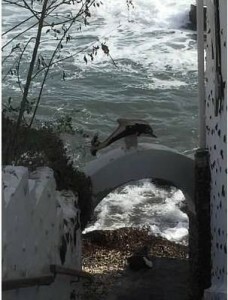 If archaeologists and curators are going to draw on modern examples to establish what we know port towns have “always” been like, throw in terms like “bourgeois” and “parvenu” to describe a merchant class, or refer to Naukratis as “ancient Egypt’s Hong Kong,” then some dialogue with modernists may be in order. I don’t mean to single out archaeologists; historians are not immune to the allure of the timeless port town. Observe David Abulafia’s thread of reasoning on prehistoric Troy: “contrary winds could render entry into the Dardanelles impossible for weeks at a time” therefore ship’s crews must have lingered for long periods at that strategic chokepoint; hence, we should not waste too much time debating the language or ethnicity of some entity called “the Trojans,” since it is likely that as a “trading station,” it would have begun “to attract people of varied origins, as have port towns ever after.” Are we so sure that we know what it means for sailors and traders to enter your community and interact with it regularly over a long period? Modernists increasingly see that as a problem for discussion, rather than as a self-evident proposition. I’ve shown that the archaeology of early Mediterranean ports offers a boiled-down version of what I’ve called the coastal questions. Asking these questions about the distant past turns out to be a handy way to confront what we think we mean when we frame any general statements about port towns and urban cultures. These ancient examples also challenge us to really think about the threshold of proof. What amount, or types, of evidence would suffice to establish the presence of that evanescent wisp, the cosmopolitan spirit? In the case of Naukratis, the port is named and discussed in some detail by a contemporary, Herodotus. He outlined the scope, depth, and duration of the Greek-Egyptian encounter that unfolded there, even specifying the legal arrangements that governed it and the purpose of the areas set aside for Greek worship. The 2015 Guardian article on new discoveries at the site in fact repeated many of Herodotus’ statements about the port. The claim is that our reading of the ancient text and the evidence from the archaeological findings tend, in general, to inform and support each other. Akrotiri, however, is one thousand years earlier. It may be helpful to establish some reference points, particularly because (for those of us who don’t study this for a living), “ancient Mediterranean” is a pretty nebulous and inclusive category. The oldest written account (that we know how to read) of a Mediterranean trading voyage dates from almost 700 years after Akrotiri’s destruction (an Egyptian narrative of a trading mission to Byblos gone terribly wrong in 1075 BCE). The people of Thera kept records in Linear A, a script that survives only in a few instances, and that we do not know how to read. We don’t know what language(s) the inhabitants of Akrotiri spoke. Even the name we use for the ancient town is simply borrowed from the modern village nearby. 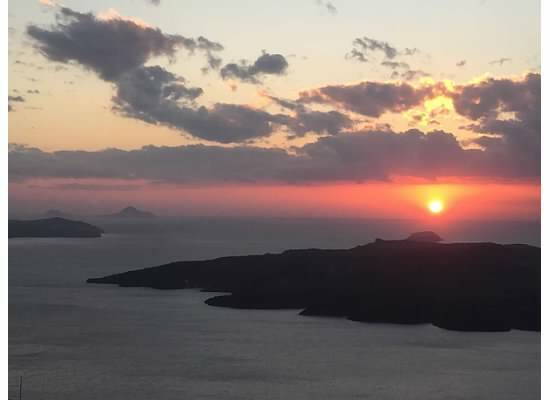 The Aegean setting may suggest an element of the familiar, but depending on which dates you prefer for Homer, his birth lay centuries in the future. Ship technology was extremely basic, and relatively speaking, brand-new in the Aegean. Abulafia remarks on the early drawings of small oared vessels, “centipede-like objects with raised prows.” The later frescos at Thera are important as proof that by the seventeenth century BCE, higher bulwarks had come into use, and the new ships actually had sails. However, the navigational confidence and blue water voyages of the Phoenicians lay in the distant future. Akrotiri is not just another Mediterranean port town with a claim to the cosmopolitan label. What we are looking at in Akrotiri is possibly the earliest human society for which this claim has ever been made. Lacking a helping hand from written records, Akrotiri’s trading relationships must bear a great deal of the weight here. It is possible, however, that we are looking at an interlocking skein of micro-regions rather than a trade superhighway. This is a major preoccupation of Corrupting Sea, which draws attention to the important role played by of line of sight. Akrotiri, for example, was 60 miles due north of Knossos; Crete is visible from the site on a clear day. Thus, the presence of these much-travelled objects could be explained quite plausibly by a long series of short relays, a passing of the baton only between adjacent micro-regions. Such a conclusion would have important implications for our ideas about the flavor of cosmopolitan port towns in this period. In the absence of regular long-distance point-to-point voyaging, how diverse was the waterfront after all? Meanwhile, the archaeologists Manning and Hulin offer some arresting insights on how to measure the depth and intensity of trade and cultural contact. Does the presence of Minoan goods in Egypt or in Canaan (and vice versa) imply an “artistic and ideological koiné linking dispersed elites around the east Mediterranean in the Late Bronze Age”? No one disputes the existence of these imported goods, yet the total known corpus of these items is only 1,118 scattered across a 600-year period: just a steady trickle of 1.9 objects on average per year. Again, if intercultural exchange was a meander rather than a torrent, how much tolerance of difference did trade actually require? A different angle of attack takes the form of proving that the populations of the port towns were diverse, and carrying the reasoning forward from that point. For example, the floor plans of the houses and even the urban layout in Thapsos—an island just off the Sicilian coast—greatly resembles what we find for Cyprus in the same period. Abulafia interprets this and related discoveries, plausibly enough, as evidence of either significant contact, or of a “mixed population.” Lead tablets retrieved from lagoons along the southern coast of France, dating from the fifth or sixth centuries BCE, record a mixture of Greek, Etruscan, and Celtiberian names. DNA testing of human remains is a new frontier here; already, checks for rare, local trace minerals present in the bones have been used to spot individuals buried far from their region of birth. It is possible to build a circumstantial case for cosmopolitanism without written records. And perhaps an archaeologist would retort that if I’m expecting more than circumstantial evidence, I’m misunderstanding what prehistoric archaeology is! Still, I’d like to insist on the distinction between proving diversity was present, and proving that a community was cosmopolitan. Indeed, we do not need to look very far afield to think of examples where living cheek by jowl has not produced much in the way of amity. Ash Amin, an expert on multiculturalism in contemporary urban spaces, has written: “Habitual contact in itself, is no guarantor of cultural exchange. It can entrench group animosities and identities, through repetitions of gender, class, race, and ethnic codes…” In a way, Amin is only lending academic weightiness to something that common sense and daily experience might have suggested to many of us. If smart people are prone to forget this when dealing with Mediterranean evidence, then maybe we are back where we started. Henk Driessen and Dieter Haller have asked us to be mindful of why the term “Mediterranean” is deployed and what work it is thought to perform. In that spirit, it is worth observing that in our century, “Mediterranean” often means “cosmopolitan,” or is used interchangeably with it in a rather slippery way. It might be helpful to take a break from using both terms for a while, or at least become more self-conscious about our decision to use them. Using the term “cosmopolitan” less often doesn’t mean abandoning a view of these port towns as vibrant and complex. It does mean recognizing that coexistence is volatile, and very traits we like to praise can carry with them both positive and negative potential. In Corrupting Sea, Horden and Purcell quote Michel Gras: “qui dit emporion dit… confrontation ethnique et culturelle, réussie seulement dans un but économique.” [“Whoever speaks of emporia is necessarily speaking of ethnic and cultural confrontation, successful only in an economic goal.”] They praise this remark, but do not pursue its implications. However, the U.S. sociologist Elijah Anderson has recently offered a book-length exploration of that very line of thought in The Cosmopolitan Canopy. Robert M. Hayden, “Antagonistic Tolerance: Competitive Sharing of Religious Sites in South Asia and the Balkans,” Current Anthropology 43, no. 2 (April 2002), 205-231. Su Lin Lewis discusses the “diasporic public sphere” in her “Print and Colonial Port Cultures in the Indian Ocean Littoral: Penang and Rangoon,” Journal of the Malaysian Branch of the Royal Asiatic Society, 82, no. 2 (December 2009), 9-24. The role of storytelling, ethnic jibes, and rumor takes center stage in Jonathon Glassman, War of Words, War of Stones: Racial Thought and Violence in Colonial Zanzibar (Bloomington IN: Indiana University Press, 2011). It will be apparent that I range well beyond the shores of the Mediterranean in that essay. But perhaps part of the problem with this area of study is that we’ve gotten lazy about using the location itself (“it was the Mediterranean, after all”) as if it had the rhetorical force of a warrant. Maybe we are so excited about finding, naming, and celebrating the cosmopolitan in the past precisely because our current efforts in that direction are fraught, and fraying. No longer the Arcadian meadow, but the cosmopolitan idyll? Predrag Matvejević, Mediterranean: A Cultural Landscape, trans. Michael Henry Helm (Berkeley: University of California Press, 1999), 12. Henk Driessen, “Mediterranean Port Cities: Cosmopolitanism Reconsidered,” History and Anthropology 16, no. 1 (March 2005), 129-141; Dieter Haller, “The Cosmopolitan Mediterranean: Myth and Reality,” Zeitschrift für Ethnologie, Bd. 129, H. 1 (2004), pp. 29-47. Driessen, “Mediterranean Port Cities,” 138. 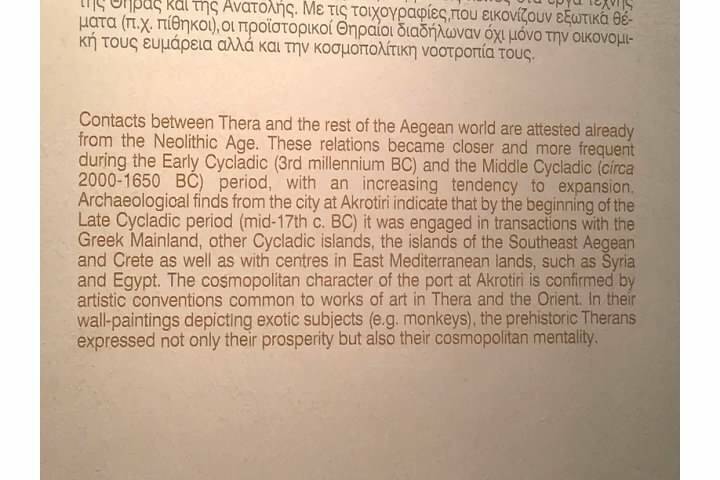 Nanno Marinatos, Akrotiri, Santorini: The Biography of a Lost City (Athens: Militos, 2015). A. Bernard Knapp and Emma Blake, “Prehistory in the Mediterranean: The Connecting and Corrupting Sea,” in Knapp and Blake eds., The Archaeology of Mediterranean Prehistory (Oxford: Blackwell, 2005), 1-23, quoted page 2. Sturt W. Manning and Linda Hulin, “Maritime Commerce and Geographies of Mobility in the Late Bronze Age of the Eastern Mediterranean: Problematizations,” in Knapp and Blake eds., Archaeology, 270-302, quoted page 281. David Abulafia, The Great Sea: A Human History of the Mediterranean (Oxford: Oxford University Press, 2013), all quotations from page 20. This appears at the end of Book Two. Pages in my copy: Herodotus, The Histories (London: Penguin, 1996), 151-152. Herodotus’ weirdly specific remark that “the prostitutes of Naukratis are somehow particularly attractive” (Herodotus, Histories, 135) cannot be substantiated by digging in the ruins, although the twenty-first century researchers did take note of the inscriptions they found by, or referring to, female merchants—a feature of the port that apparently did not capture the ancient historian’s imagination. For broader context on other regions and their ship-building “firsts,” see chapters 1-3 of Lincoln Paine, The Sea and Civilization: A Maritime History of the World (New York: Knopf, 2013). Peregrine Horden and Nicholas Purcell, The Corrupting Sea: A Study of Mediterranean History (London: Wiley-Blackwell, 2000), 125; see also page 440 for “sacred” Aegean islands apparently awarded that status because they served as crossroads or nodes in a network of mutually visible destinations. Manning and Hulin, “Maritime Commerce,” 275. Manning and Hulin, “Maritime Commerce,” 283. Horden and Purcell, Corrupting Sea, 400. A recent blog post by Caitlin R. Green about possible Phoenician/Punic colonies in the British Isles makes use of an isotopic analysis of teeth found on the Isle of Thanet, Kent to argue that 20% of those buried in a particular Bronze Age cemetery had been born in or near Iberia. Ash Amin, “Ethnicity and the Multicultural City: Living with Diversity,” Environment and Planning A 34, no. 6 (June 2002), 959-980, quoted page 969. Consider the tactical deployment of the terms “Mediterranean” and later, “cosmopolitan,” at critical moments in Kwame Anthony Appiah, “How Muslims Made Europe,” New York Review of Books, November 6, 2008. Horden and Purcell, Corrupting Sea, 397. The anticipated issue is number 72 (2016). Mohamed Awad and Sahar Hamouda, eds., Voices from Cosmopolitan Alexandria (Alexandria: Bibliotheca Alexandrina / Alexandria and Mediterranean Research Center, 2012), 10.